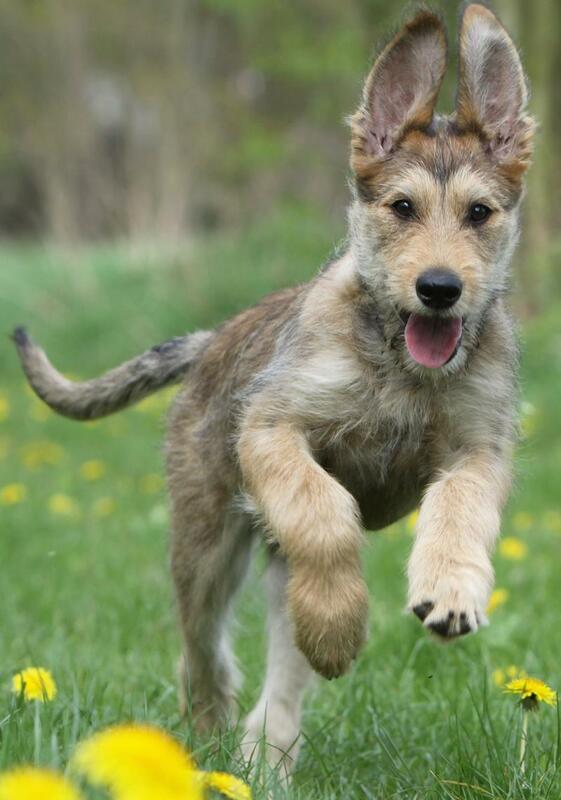 Berger Picard is an ancient French herding dog breed. 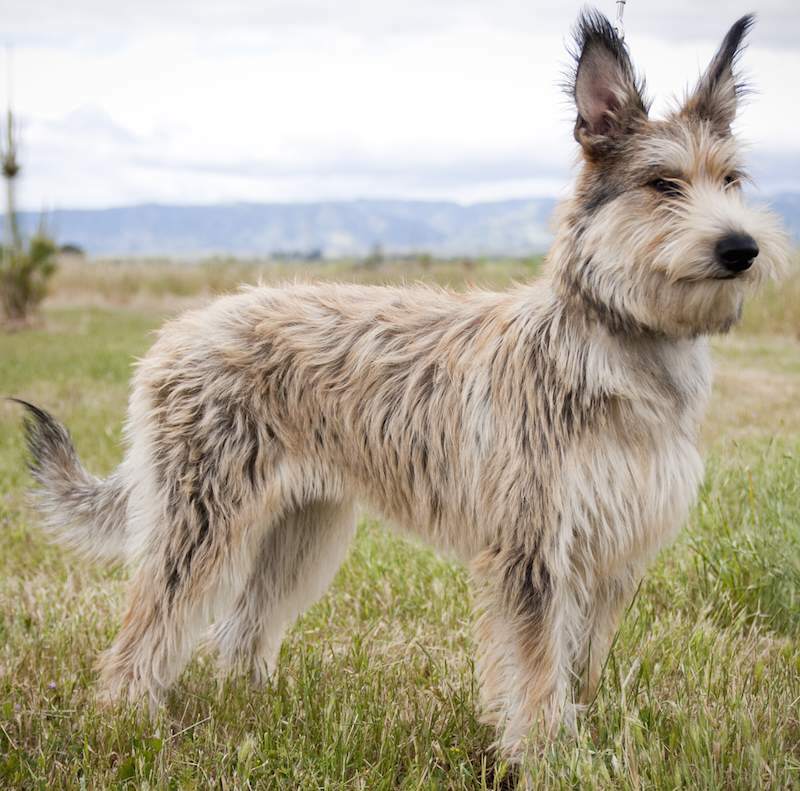 The Berger Picard is known as a coated breed without coat problems. 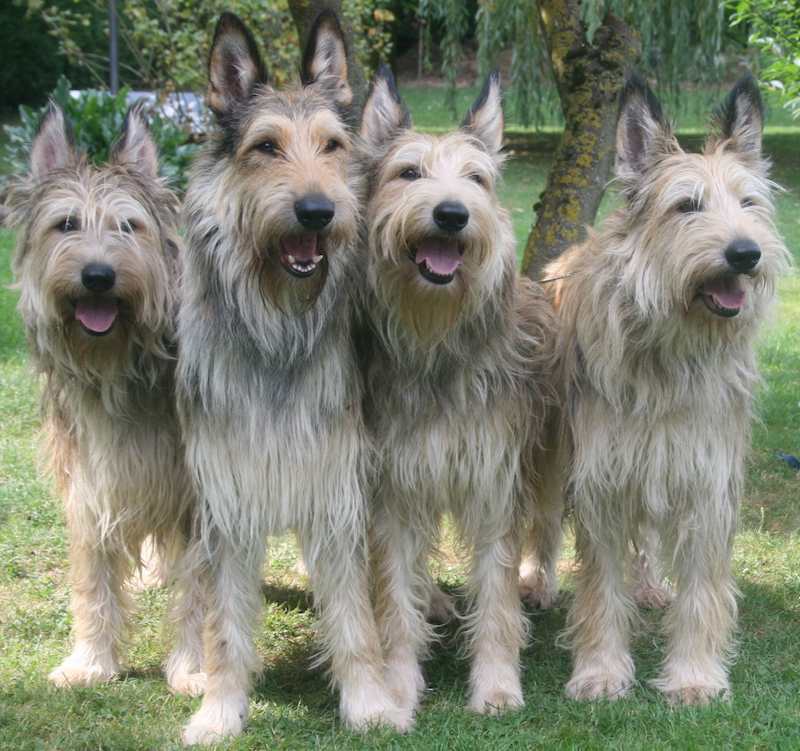 The Picard, also called the Picardy Sheepdog or Picardy Shepherd, is a tousled canine with an air of casual elegance about him. 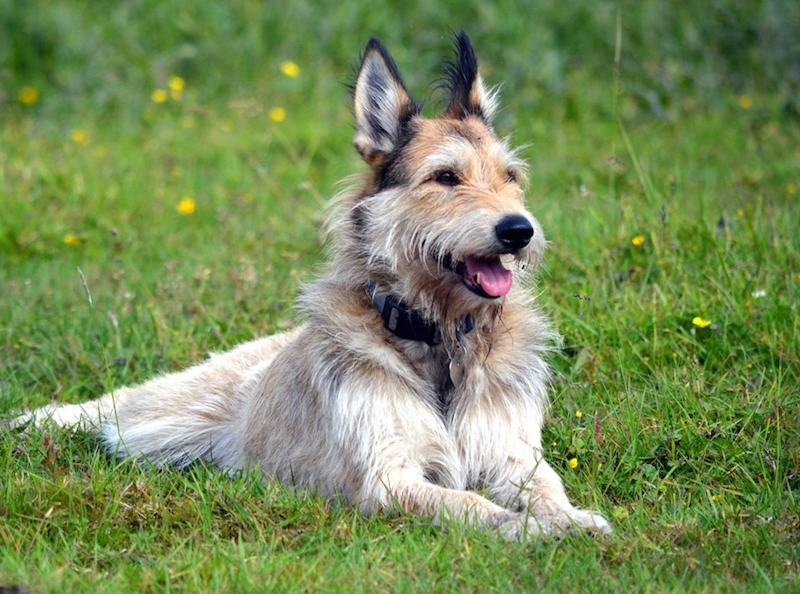 The Berger Picard almost disappeared during World War II but has regained strength since then, though he’s still somewhat rare today. General Appearance: Sturdy looking dog, medium sized, with a hardy but elegant shape, robust, strong and well built, with an intelligent, alert and lively look. 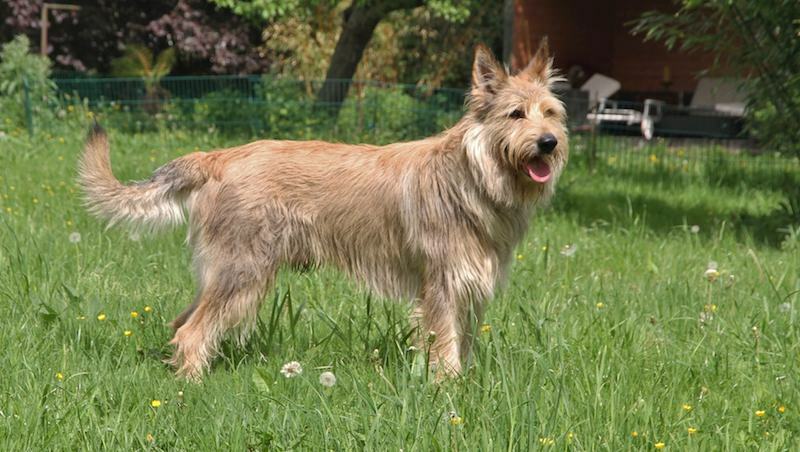 This dog is characterized by his appearance which is similar to that of the Griffon. Size: Height Between 60 and 65 cm. for the male, between 55 and 60 cm for the female. Fault: Up to 2 cm over the limit. Head: Must be proportioned to overall size without being massive. Very slight stop, equidistant from tip of nose to top of skull, skull rather large but not exaggeratedly so. Hair approximately 4 cm long. Eyebrows well defined without hiding the eyes. Fault: Stop too pronounced or insufficient. Coat too short or too long. Eyebrows absent or too pronounced. Forehead: Viewed from the front it must not be flat but rather slightly arched with a slight depression in the center of the frontal sinus. Fault: Not sufficiently arched or too arched, depression too accentuated. Cheeks: Must be neither too strong nor too flat, must be fairly round. Behind the cheeks, the hair is of the same length as that of the body. Fault: Cheeks too full or too flaccid or not muscular enough. Muzzle: Strong, not too long, must not be pointed. The nose is always black, lips are dry and tight, back of nose is straight. Slight mustache and beard. Fault: Muzzle too long, narrow or too strong, pointed or too square, closed nose, measly spotted nose, commissures of the lips coarse, fleshy lower lip, hooked bridge, absence of mustache or beard. (It is important to remember that the hair on the head must be approximately 4 cm long and that both mustache and beard must be clearly visible.) Jaws: Strong, tightly closed with no superior or inferior prognathism. Fault: Slight prognathism, 2 missing premolars, no CAC or reserve. Four premolars, none excellent, caries (according to their severity), broken or cut teeth. Ears: Medium size, with a large base, the base being set rather high on the head reminding one of sheep’s ears,always naturally held straight, tips slightly rounded, a slight divergence in the way they are held is tolerated. Length: 10 cm. Never more than 12 cm for a male of maximum size. 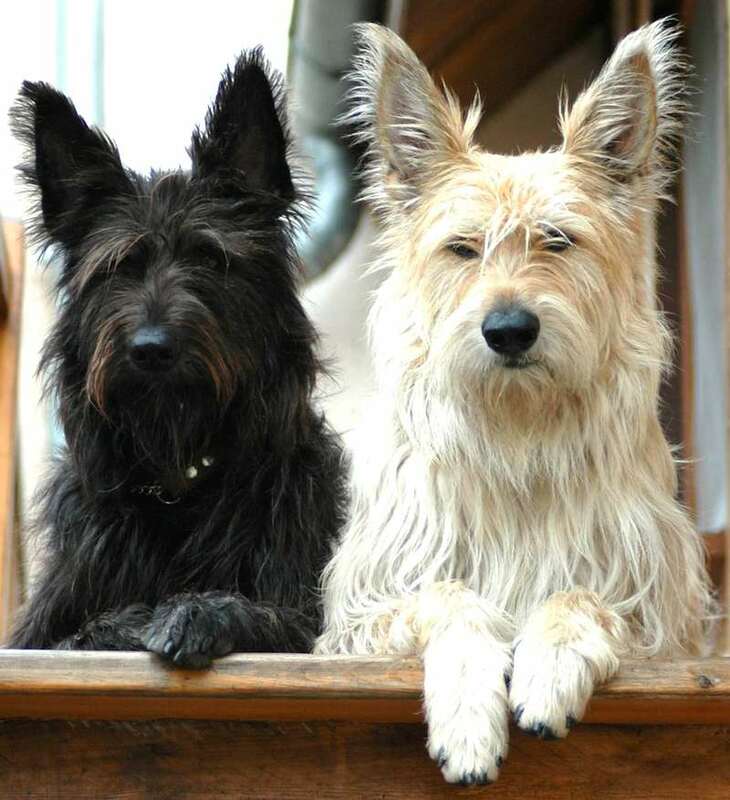 Fault: Ears too large or resembling those of the Belgian Sheepdog, set too low or set too close together on the head. Eyes: Medium size, not prominent, dark coloured, neither light nor particoloured, more or less dark according to the colour of the coat (but in any case, never lighter than hazel). Fault: Everything that does not correspond to the description. Expression: The expression must be neither vicious nor suspicious. Neck: Strong and muscular, of a good length, upright when in action and reachy at the shoulder, carrying the head proudly. Fault: Long skinny neck, short thick neck, neck that emerges abruptly from the shoulders, flabby skin. Body: Brisket deep without exaggeration, must not descend lower than the elbows, the perimeter of the thoracic cage, taken from immediately behind the elbows, must be superior to 1/5 of the height at the withers, the length of the body must be slightly superior to the height at the withers, the back must be straight, the loins solid, ribs well arched in their upper third then flattening out gradually towards the sternum, belly slightly tucked in, haunches melting progressively into the buttocks, the bony structure apparent but without exaggeration. Fault: According to the severity of the defect, body too heavy or too light, too long, too leggy or too low to the ground, rib cage too flat or too curved, bouvier-shaped body, haunches too straight or too tapered. Tail: Hairy, with hair the same length as that of the body. At rest, the tail must reach the tip of the hocks and hang straight with a slight curve at the end. In action, the tail may be held higher but must never be held over the back. Fault: Rat-tail, tail too hairy, too short, carried sideways, poorly carried. Forequarter: Shoulders long and slanted imparting much ease to the movements, muscular without being heavy, the legs are upright, timber is dry, joints are well marked without seeming malformed, pasterns are slightly sloped from back to front giving suppleness to the limb and facilitating quick stops. Fault: Shoulders too long (Greyhound like) or too straight (Bouvier like), spindly or heavy, too far apart or impeding movement, timber too slight or too heavy, joints weak or seeming knotty, pastern too straight, or too slanted and pushing the foot too far forward. Hindquarters: The thighs are long and muscular. The upper portion of the thigh is fairly long, the knee-joint is strong, the hindquarters must not be too straight nor too far behind, not too close nor too open. There must be no disharmony between the thigh and the haunches, all must merge together in a pleasant curve. Solid legs support the hindquarters strongly but lissomly, timber is pronounced but not exaggerated. The hocks are moderately angulated, neither too open nor too closed, not too high, a good angulation of the heel is absolutely essential for our sheepdog. Hind cannons strong and dry, perpendicular to the ground when standing, all limbs solidly upright when seen from all sides. Fault: According to the severity of the defect. Feet: Rounded and short, well closed, arched, nails short, strong and dark coloured. No dewclaws or extra fingers, a dog with dewclaws is not disqualified but rather faulted. Firm sole, showing a certain suppleness; being a plantar cushion, the sole must be capable of absorbing part of the impact. Fault: According to the severity of the defect. Coat: Harsh, semi-long, not curly, not lying flat, must be harsh and crunchy to the touch. The length of the hair must be 5 to 6 cm over the whole of the body including the tail. Undercoat fine and dense. Fault: Hair or coat shorter than 4-1/2 cm, not sufficiently harsh, with a tendency to be curly or flat. Colours: Grey, greyish-black, grey with blackish tinge, blue-grey, reddish-grey, light or dark fawn, or a mixture of all these tinges. There must be no large white spot, a light white spot is tolerated on the chest and on the tips of the feet. Disqualifications: (a) Height under the minimum limit, even for puppy class; more than 2 cm above the maximum limit. (b) Head: lack of type, disproportion, without furnishings or covered with too much hair. (c) Forehead: flat or domed skull, receding forehead or forehead sloping over the eyes. (d) Muzzle: Disproportionate to the skull, drooping flews, nose any colour but black, lack of pigmentation in the mucous membranes (gums). (e) Loss of more than four teeth, pronounced prognathism. (f) Ears badly carried. (g) Particoloured, slanted or dissimilar eyes, eye colour too light. (h) Wild expression, evasive look. (i) Body: any excessive deviation from the standard. (j) Tail carried always over the back, carried low because of surgery (nicking), rudimentary tail or no tail at all. (k) Forequarters: any excessive deviation from the standard. (l) Hindquarters unsound (faulty, defective) overall. (m) Double dewclaws on every limb. (n) Coat: hair shorter than 4 cm or longer than 6 cm, curly or very flat, soft or woolly. (o) Coat colour: black, white, harlequin or piebald tinges, too much white on the chest, totally white feet, white in the coat in any other areas than those indicated.